Par can lighting, RVA, Richmond, rent, rentals, Charlottesville, Fredericksburg, northern Virginia, Washington, DC, Hampton Roads. If you are looking for lighting rental for your entertainment event, wedding reception, musical or dramatic performance or a really great karaoke night AVIVA Rental Systems can help you select the best combination of lighting to make your event or celebration shine. 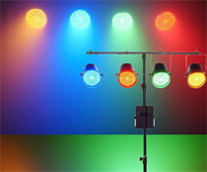 AVIVA carries the Chauvet LEDsplash™ Jr. An RGB color mixing parcan made up of 86 highly efficient, super-bright LEDs. The unit features red, green, and blue color groups (44 red, 21 green, and 21 blue). Each color's intensity can be controlled individually to create a large range of different colors. The LEDsplash Jr. can operate in stand-alone and master/slave modes in addition to DMX. Call AVIVA Rental Systems at 804.353.9212 or toll free at 877-564-9143 or e-mail our Event Director at doe@avivarentals.com today to discuss your lighting rental needs for your next celebration or entertainment event. Click for LEDsplash Jr. user's manual. Uplighting is great for creating true atmosphere for any themed party, celebration or wedding reception. Or, if you are looking to blow it up, AVIVA can help you with DJ lighting, intelligent lighting, as well as light tree stands and trussing systems and rigging for the lighting setup. Don't forget the fog machine. 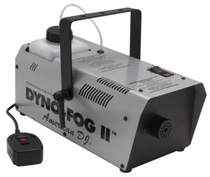 The Dyno Fog II from American DJ will really make your light shine! Please note, the fog machine emits a hot vapor and should be used with caution and attention!! Call AVIVA Rental Systems at 804.353.9212 or e-mail our Event Director at doe@avivarentals.com today to discuss your lighting needs for your next celebration or entertainment event.